Lately, I’ve had a slew of bad interactions communicating with companies over email. They’ve made me feel confused and frustrated — wondering whether I should use the company’s service again. I want to translate these experiences into takeaways and help you improve your interactions with customers. I take every interaction with a company seriously. If I’m not attended to or given poor service, I won’t use your business again and will likely tell my friends to avoid your business. This is the truth, and holds true for lots of customers. But what makes poor customer service and email etiquette? I’ll tell you: automated ticket emails, unexpected keyboard characters in emails, (absurdly) late responses and automated emails despite looking like the sender’s real address. Yet, all of these bad manners can be easily fixed and I’ll tell you how. I await the day customer support management systems get rid of the ticketing system that’s exposed to customers. Here is an email I received assigning me a “request #” for my complaint. I removed the company’s name and contact info for privacy reasons. Let’s first rewind to how this happened. I sent an email to the support email address. After I pressed the Send button, I saw an email response. I was ecstatic! I’d never received such a prompt email reply. But, I opened the reply and it was just an automated ticket response. I was deeply disappointed. It would have been helpful for the company to mention active customer support hours and when I would receive an actual reply. Without that information, this email was uncessary and impersonal — not the response I wanted. I copied and pasted the email address from their site; so I knew it would go to the correct inbox. You’re probably wondering what this means. Emails are usually straightforward and to the point. In one exchange with a company, I received the most confusing email exchange I can remember. 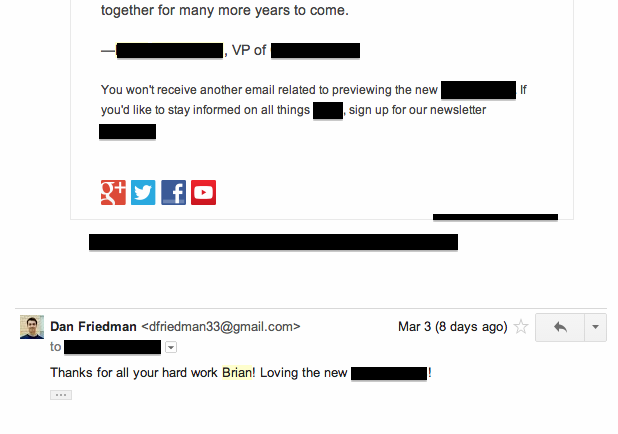 Here’s nearly the entire email discussion — consisting of the 3 images below. Emails are out of order. You would expect the most recently sent/received emails in descending order. But that’s not the case. 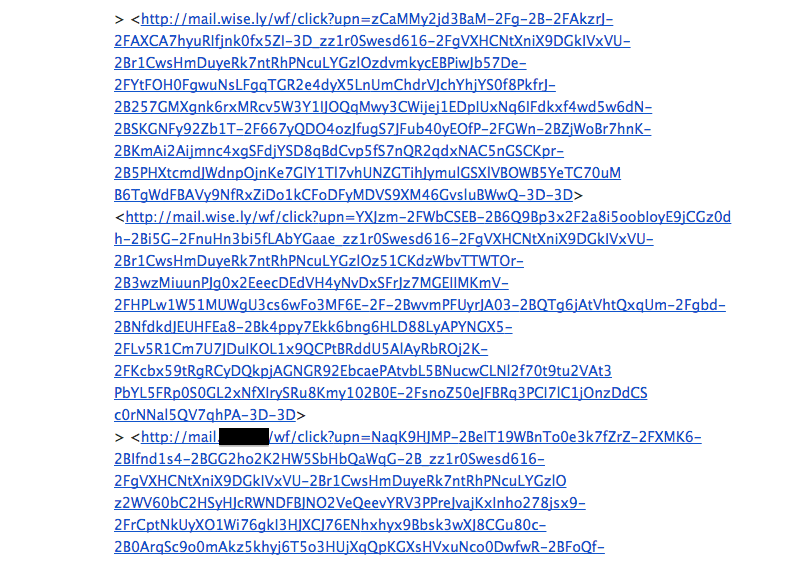 There are multiple hyperlinks, often taking up 10 lines in a row. I have to scroll a lot to find the email response. Caret characters begin every line of this email thread. This derails my ability to find the actual human response. 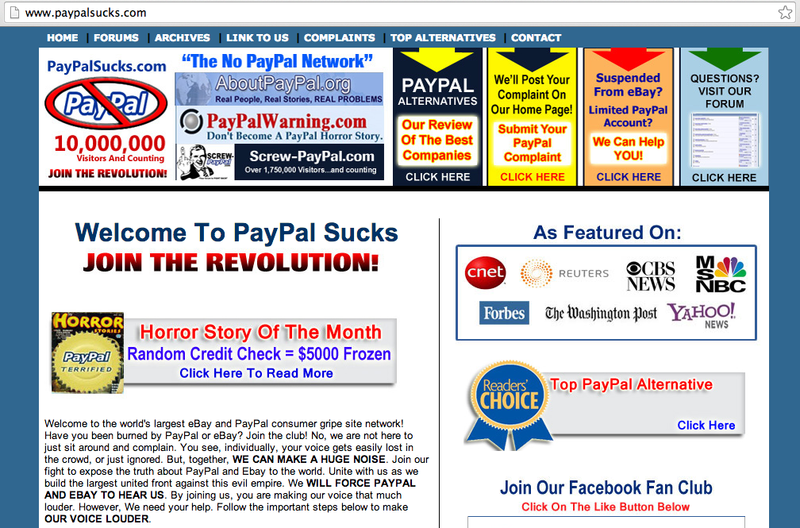 All in all, these out-of-place and unexpected characters and formatting make me question my trust with this startup. 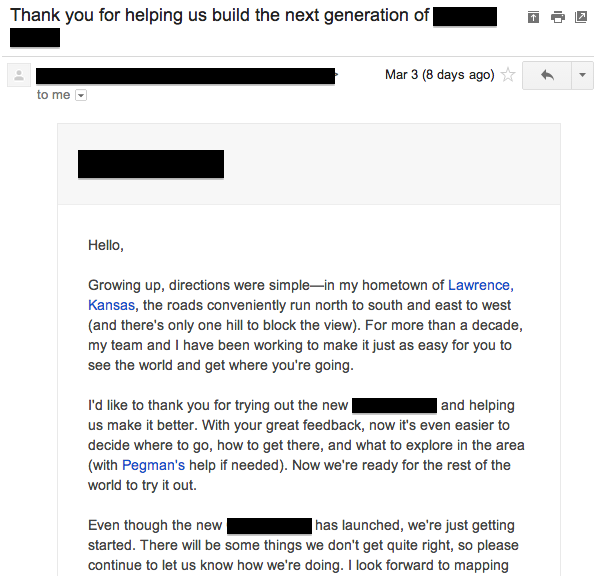 I wasted a lot of time and effort retracing my email response. Less their errors, I could have had a much smoother experience interacting with them over email. For one online education startup, I frequently receive automated emails from the CEO. They seem caring and genuine. Emails include detailed messages, GIFs and questions to engage customers. For one of the CEO’s latest emails, I replied back with a small question to ask for design help. Over three weeks later, I received a brief two-sentence reply. I was very disappointed. I frequently received prompt and helpful feedback from other team members. Just a few months earlier, I had told a friend how much I admired this CEO for prompt responses, the startup’s vision and this person’s helpful attitude. I would expect the CEO to have just as good email etiquette as other company employees. After all, the CEO is regarded as ‘the face’ of the company. Yet, I received a dismally late email reply that greatly disappointed me. The CEO did not outline an apology for this late response or supply helpful advice that could have guided me to better use the company’s online education service. I don’t plan on emailing the CEO again. Maybe my earlier beliefs about this person were mistaken? 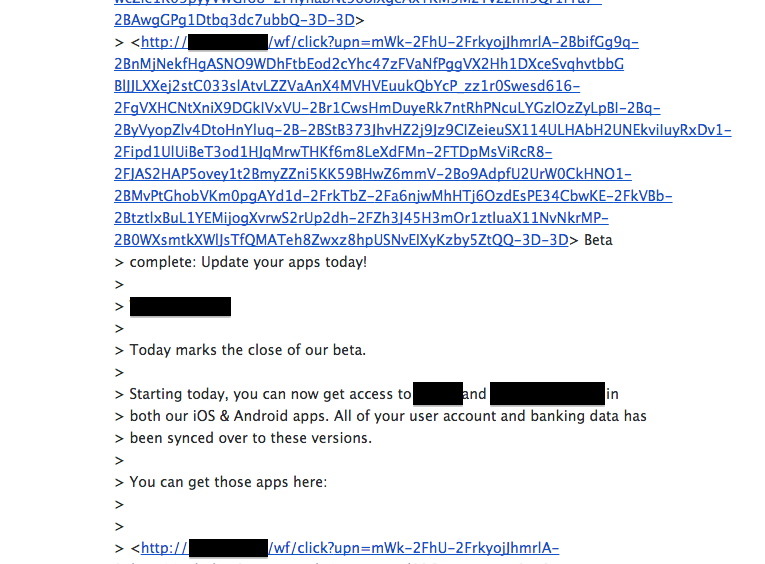 A few weeks ago, I received an email from a new service I was on the beta test for. His email address was in the format: firstname.lastname@company.com. The address looked legitimate. Though, I knew the email was likely sent to thousands of beta testers. I loved using the new product and wanted to thank this leader personally. So upon getting his response, I replied. All of a sudden, I get an immediate reply. In the response, Brain, the sender, had a “+noreply@” at the end of his email address. That wasn’t there before! I felt duped. The sender added a layer of friction to receive feedback. Rather than acknowledge my email response, he automatically supplies a link to a form to accept feedback. What if I spent a few minutes writing up feedback in the email body? I don’t want to re-write that in a new form. Out of spite, I did not fill out the survey. I would recommend that this employee engage with customers over email. Back and forth communication over email would allow this employee to ask further questions based on the beta testers’ initial feedback. Therefore, the employee could dig down into more details about what works well and what doesn’t. These were bad experiences. But, companeis can easily learn from them and improve. So can you. If using your customer relationship management software compromises the formatting and quality of your emails, then don’t use that service. 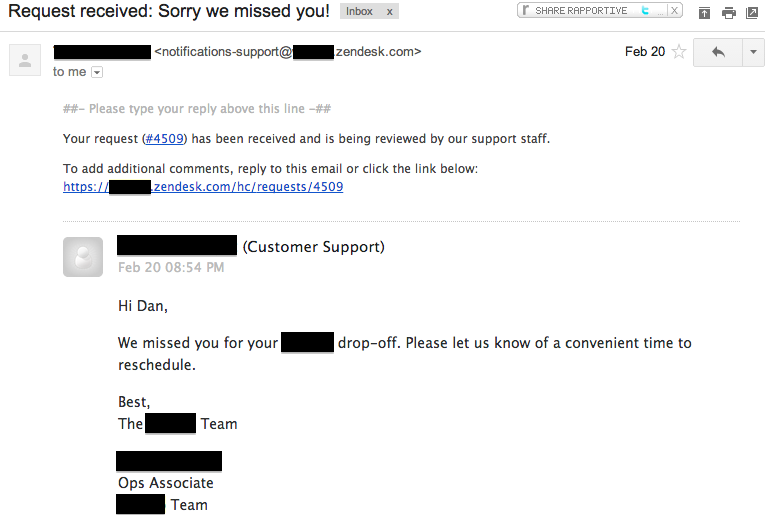 In two examples, Zendesk utilizes automated emails and poor email formatting. 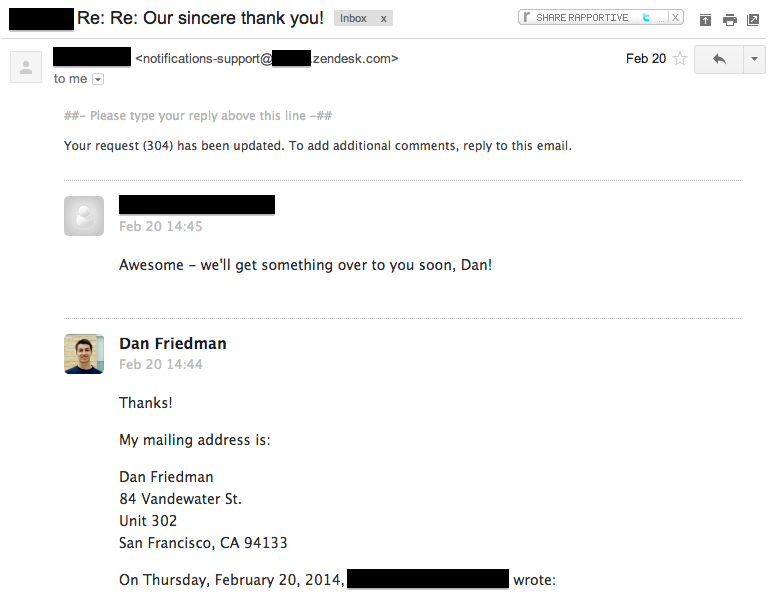 If you choose to use Zendesk, be wary of the responder so that you keep your email quality high. If needed, find an even better platform or any alternative hack to send quality personal emails. I hope, you, as the reader, have learned from these companies’ mistakes and will utilize genuine interactions with customers. Because if you don’t listen to them and learn from them, someday your customers may build a website devoted entirely to shaming you and your poor customer service. So have at it: send prompt replies to customers, use automated emails (if needed) to establish rapport with customers, use clear email formatting treat customers well. In return, customers will treat you well back.